Will the world end with a Sprite Deluxe Tourer? Despite intensive storms, coastal erosion and record flooding, the average British citizen had been ambivalent to the threat of climate change until last weekend. However, the full horror of global warming has come closer to home after scientists confirmed that the weekend’s early clogging of Britain’s road network by caravans was ‘almost certainly due’ to the effects of global warming. The unwelcome early appearance of the dreaded caravans has raised fears that our collective actions are ruining historic infrastructures and areas of scientific special interest such as the M1 and the elevated section of the M4 for future generations. Leading biologist, Simon Parsons explained how the life cycle of the caravan had been impacted by the change. Unchecked, it seems that the early trend is set to continue. 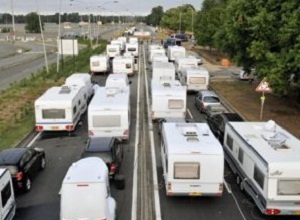 “Within the next decade,” Parsons predicts, “we can expect to see caravans snarling up Britain’s roads by Christmas.